The TonB-dependent transducer is required for plant pathogenicity in several plant pathogenic bacteria. In this study, we investigated the role of a putative TonB-dependent transducer, XAC4131, in Xanthomonas axonopodis pv. citri, the causal agent of citrus canker disease. A mutation in the XAC4131 gene caused a delay in the elicitation of the hypersensitive reaction in tobacco leaves. 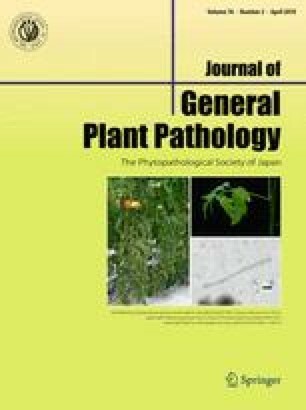 However, the pathogenicity in citrus leaves was similar to that of wild type. In hrp-inducing medium, XAC4131 controlled the expression of the hrp regulatory gene hrpG. Also, XAC4131 was involved in expression of the adjacent genes rpoE XAC4129 and XAC4130, which encode RpoE(XAC4129) and FecR-like protein, respectively. The results suggest that XAC4131 controls the expression of hrpG indirectly, probably via rpoE XAC4129 and XAC4130. Furthermore, we also demonstrated that transcription of rpoE XAC4129 , XAC4130 and XAC4131 seems to be regulated by the Fur protein. We thank Drs. U. Bonas, J. Leach, A. Yamazaki and A. Bogdanove for their encouragements and strains. This research was supported in part by a Grant-in-Aid (No.17108001) and by a grant for Promotion in Science (No.13073) from the Ministry of Education, Culture, Sports, Science and Technology of Japan.